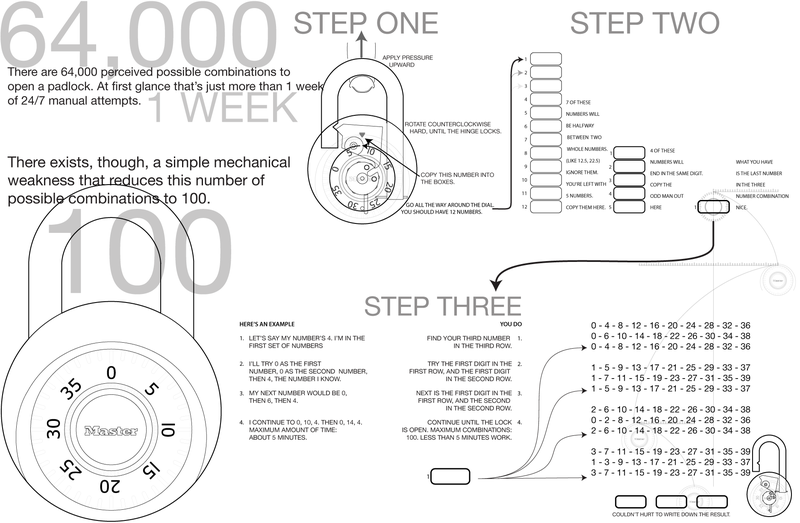 Long, long ago we covered a method to crack a Master lock in about 30 minutes or less. Here’s a revival of the same method but now the instructions to retrieve the combination are in info-graphic format created by [Mark Edward Campos]. If you didn’t get to try this the first time around, here’s how it works: A combination of a physical vulnerability, math, and brute force is used. First, the final number of the code can be obtained by pulling up on the latch while the dial is rotated. Because of the way the lock is built the correct number can be extrapolated using this trick. Secondly, a table of all possible first and second number combinations has been calculated for you. Third, it’s your job to brute force the correct table of possibilities which includes only about one hundred combinations. We’re not really into felony theft and hopefully you’re not either. But, we have a nasty habit of needing to use a combination lock that’s been in a drawer for a few years and having no idea of what the correct code might be. Update: We’ve had a lot of comments about shimming as a better method. For your enjoyment we’ve embedded a video after the break that details how to shim a Master lock using a beer can. Just remember: friends don’t let friends drink and shim. ← There I Fixed It: A blog about hacking, poorly. haha, I used this trick just the other day. I work in a recreation center and we lend out locks. Each lock has a number written on the back in sharpie that corresponds to a table we keep telling us the combination. well the numbers wear off after a while and if nobody catches it, pretty soon you don’t know which is which! I don’t think there should be much worry about theft, as you can cut or shim a master lock MUCH faster than this. aye you can shim this lock in seconds if you already have one cut. you do have a shim tucked behind your drivers licenses right? If this were some kind of DRM scheme, you guys would already have someone ringing your doorbell with a Seize & Decist order. I wonder if you’ll get one for this, and if so, how long it will take. considering we posted the original story in 2005, I think we’re ok. no one has sued us yet. Ha. If we did get a sieze and desist order I think it would be because people can use this to reclaim their lost combinations and don’t have to buy a new lock. @kyle: of course! several, made from red bull cola cans. @jac: This method is VERY old, just the graphic isn’t. I agree with the above, a shim is much faster and easier and can be made with commonly-available materials or brought along. I doubt anyone would attempt the brute-force cracking without carrying the list with them anyway. This method is from at least the 1940s, and maybe earlier. Richard Feynman talks about indpendently discovering (or maybe inventing) the technique while he was working at Los Alamos on the first atomic bomb. All the top secret cabinets were secured with locks that could be defeated this way. BOOOOOOOOOOOOOOOOOOOOOOOOOO! Beer/popcan hack 4tw. That is all. There are errors in the number sets for step 3: To fix it, add 2 to the first number in row 2 of each block of numbers. There are errors in the number sets for step 3: The first number in the second row of each of the four sets of numbers is wrong. Add 2 to each to fix it. we used to use this and shims to play pranks on ppl at school. but my school forces us to use master locks with a key hole in the back for a master key. so we made our own key from tearing it apart and looking at the pin heights. took a while to get it right but it works on every school lock. My main problem with this is that ….What if the lock is LOCKING something already???? haha…..I broke one of these open in high school when throwing it at a wall. Credit to whom ever did this though….. I think that someone should get a few hundred locks and find out why they stop at those half numbers, and how they are related to the combination. Also as a note, some locks only stop at 4 even numbers and the last digit is one of those. I used to open allot of locks in high school. Can I at least get credit for the creation of the image? It is a fairly common punishment in boot camp, 90 people times 2 locks each, = 180 combo locks all locked up in a big ball. Takes about 2 hours to get them all unlocked, and no; there are no beer cans to be had. Also, my website (the creator of the diagram) is http://www.markedwardcampos.com. I would appreciate it if the image linked there. Thank you. Thanks for clarifying the 12.5 business — I really couldn’t tell what “between two digits” meant. But though I’ve never heard of any of this before, symmetry concerns lead me to reiterate Simon E’s point: it really feels like each of the second rows is has a number that is off by 2: 0->2, 1->3, 2->4, and 3->5. Maybe that’s wrong, but it fits the mod-4 pattern much better that way. Back in high school we just whacked them with a textbook until they opened. Shims and codes are overkill. everyone’s saying “it’s so much quicker to shim/cut the lock.” well, sure it is if you’re trying to break in to something. But what if you find an old lock in a drawer and want to use it? Shimming or cutting it won’t give you the combination to use it. does the shimming work with key locks as well? Just wondering because my boyfriend’s ex took off with his key to his storage locker a couple of years ago when she moved out and he wants to get into it to see what she took (if anything) but we don’t want to cut it off, we’d rather find a way to open it and then replace the lock. It’s in an apartment with nosy neighbors so if one of them saw us trying to cut the lock off, they’d probably call the cops thinking we were planning on breaking into all of the storage lockers…. figure out the model of lock and post it here. I’m a locksmith, and shimming a padlock is far more efficient. These posts in regards to locks are just ridiculous, and so newbieish. The last one I saw… decoding key cuts via pictures & software, how genius, LOL! Use a mico meter, and you’ll know the cuts before the software could even finish installing, geeze. @davey j: I have the same problem with one of my locks. Does anyone know why the combo isn’t there? I am sorry, but I remain unimpressed. Going to a high school ( I am now in college ) where every single locker had a master lock on it, it was only natural to figure out a way to crack them. My friend and I figured out a mathematical way to crack a lock in under 5 minutes, 2 if you got lucky. And this was the actual combination. Soda can shims are too unreliable, sure they work in a pinch, but unimpressive to say the least. Now what really made us proud was when we created the keys that went in the back of the locks. ( school issued, so of course there was a master key ) once we had all 3 keys made for the variations of the different locks. Only good was to come of it, after all, we did have a key to every single locker in the entire school. You can actually reduce the number of possible combinations to 64. Kohr – I think you missed the point of the photo decodes/replication. Yes analyzing a key when you actually have it is done considerably faster by other methods. The photo replication is designed for hands-off, meaning you can just take a picture of a key from a distance, and come up with a working replica. Rather hard to do that with a micrometer. Does anyone know if it makes a difference if the master lock was school issued with a key hole in the back? I tried it on my lock from high school and it won’t work but I cracked my husbands old lock with that method. Okay, So I went through steps one and two and got 38 for my last number. I’m a little confused because I vaguely remember the combination having an 11 in it which doesn’t seem possible according to this chart. Am I crazy? Also, I tried the beer shimmy and succeeded only in lodging a piece of aluminum in the lock. I’m currently going through the combination list, but something tells me that I’m going to have to use the bolt cutters for this one. argggggggggg cant do it too hard!!!! I made an Android app that uses this process, but saves the user from having to write down and mess with the numbers. You just tell it where the dial gets stuck. It’s called Lock Hero and it’s in the Android market. It’s not open source and costs $1.99, so sorry about that, but it’s rough being a college student! For some reason it’s not working for me. did all the 100 combinations, but nothing. @ MrSomeone That worked perfectly. Thanks so much. I know this thread is old, but I just thought I would post that I have found at least one lock this won’t work with. The code is 38-2-8. If you look at the graphic you will see that there is no way to get that combo if I get the last number of 8. Sorry to double post, but I didn’t see an edit button. I just wanted to say that after reading the post saying to add 2 to the first number in the second line that the combo 0-2-8 did work for me. Sorry about that. I don’t know that I will come up with a last digit of 8 using this method though, I still haven’t tried. I guess I’ll do that now. Theres no point in cracking the combonation on these locks. As shown by the diagram image, the latch mechanism is held in place by spring tention, making them vulnerable to bumping. All you have to do is give a good tap the U-bolt wile lightly pulling it. Umm yeah there’d be a point say if you wanted to actually USE THE LOCK! Thanks, worked like a charm. Saved me renting bolt cutters.